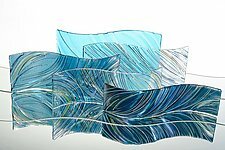 "When I create glass, I am inspired by a lifetime as a classical violinist. 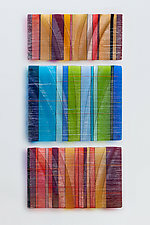 I'm in love with color and light and flow, and my work is an abstract, playful exploration of nature and music. 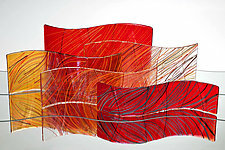 Working with glass allows me to integrate my experience and love of both. 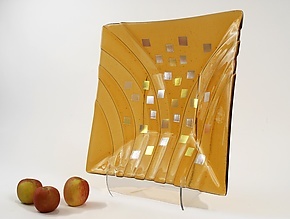 My goal is to create glass that expresses the 'oneness' of all life." 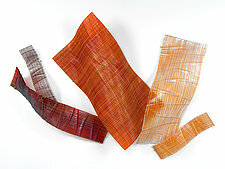 Nina Falk approaches her glasswork as a visual expression of the rhythms, patterns, and lyricism of both music and nature. 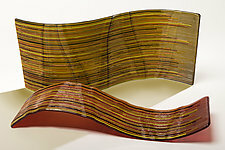 The artist studied violin, sculpture, and printmaking at the Oberlin Conservatory in Ohio and won a Fulbright Fellowship to explore violin making in Europe. 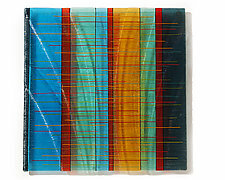 She studied kiln-formed glass at the Corning Museum of Glass and at the Pilchuck School. She is a founding member of the Arcovoce Chamber Ensemble, which performs regularly at the Phillips Collection in Washington, DC. She was artist-in-residence at the Wesley Theological Seminary in 2006.